Kenneth, or Ken as he prefers, is a Professor at Florida State University where he teaches Character Animation and Modeling. Before teaching he was a Character animator on a few classic titles like Uncharted: Among Thieves and DC Universe Online. Ken has always been a story teller, but only recently decided to dedicate himself to the written medium. After a successful Kickstarter project which involved a Cthulhu idol and a larger than life hero stopping a nameless cult from waking the sleeping priest, Ken focused on writing short stories. The Internship, published in Pro Se Productions’ Pulp Medical Is Ken’s first published story. His story will be published by Pro Se Productions as well in a yet to be announced collection. Doctors and Nurses stand knee deep in Life and Death every single day. And sometimes, it’s their lives that are at risk! Pro Se Productions and authors Kevin Findley, Kristi Morgan, and Kenneth Robkin delve into the world where saving lives collides with crime and danger. PULP MEDICAL puts professional lifesavers and the hospitals and emergency rooms they staff in the spotlight…and in the crosshairs. 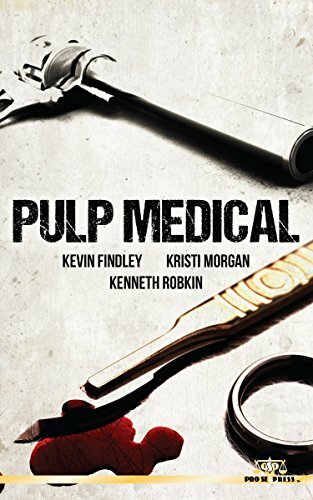 Sometimes the patients aren’t the only ones that need saving… PULP MEDICAL. From Pro Se Productions.